Known for many other things, Elizabethan era was especially famous for the armour of that period. From warfare to hunting; from tournaments to parade costumes, Elizabethan era armours were used for various purposes. The armoury of Elizabethan England became popular because of its existence as an art. Initially chain mail was used to make the armours, which was later replaced by plates of steel. Suits of chain mail covered and protected the knights from head to toe. Helmets were also considered to be a part of the armoury. Chain mail provided protection against swords and other sharp weapons. As the weapons became larger and dangerous, the composition of armoury changed to plates of steel. During Elizabethan time, the main aim of armour makers was to make the suits more and more elaborately decorated. Armours were of blue, golden, silver and many other colours. The work of armour makers went in coordination with artists and designers. Armours for the protection of kings and nobility were magnificent. The detailed structure and design made the armours quite costly in the days of Elizabeth 1. One suit of armour was as expensive as one small farm land. In those days, the hierarchy started with the page, who was a young noble. Then he moved up to the role of a squire, and, then a knight. There were various elements in the armour of a knight in Elizabethan times. It consisted of linen under shirts and under pants, woolen stockings, sabatons (armour for the foot made of iron plates on the boots), aketon (arming doublet). The armour protecting the arms comprised of layer of chain mail over the arms, besagues (small round shields to protect the armpit), rerebrace for covering the upper arm, and, vambrace for the defense of the lower arm. The armour protecting the legs was made up of greaves (to protect the calf and ankles), poleyns (protecting the knee cap), and, cuisses which defended the thigh. Other parts of the complete armour suit were, chest armour (to protect hips, abdomen and lower back), back armour, face protection, hand armour (called gauntlets), spurs, and, surcoat. Surcoat was a robe with a belt around the waist. A dagger and a sword were attached to the belt of a knight. 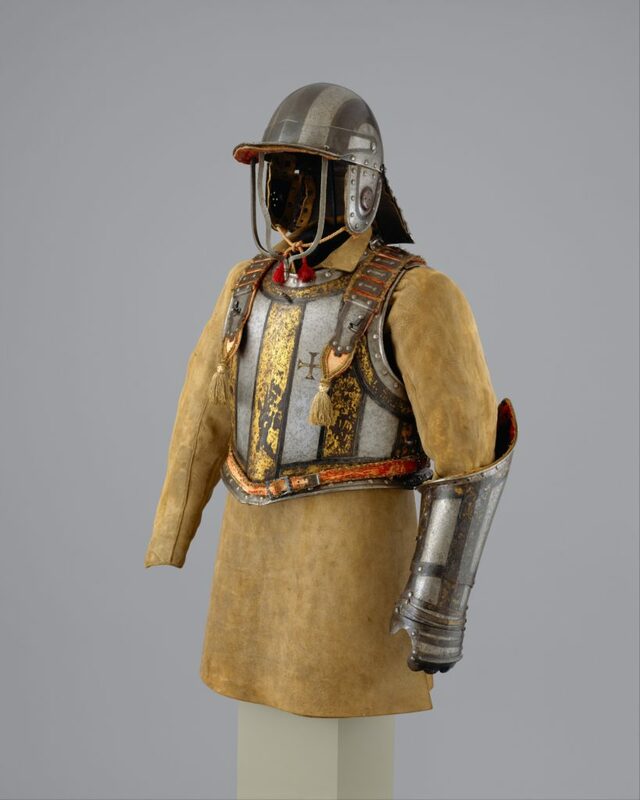 More than warfare, armours were used in tournaments in the Elizabethan era. The tournaments were the favourite sport of the knights in those days. There were two different types of tournaments, namely, joust and melees. Both of them had different types of combat method involving fighting on foot or on horseback. Armours were also made for ceremonial purposes. A grouping of weapons and armour used to hang over a knight’s tomb. Armours were also made for horses and dogs. Whereas armours for horses were common, armour for dogs were rarely used. Thus, armours and the various events associated to it were an important part of the Elizabethan era and holds significance in the history of England.